We will organise your move anywhere in Europe with our own trucks or with our European partners. 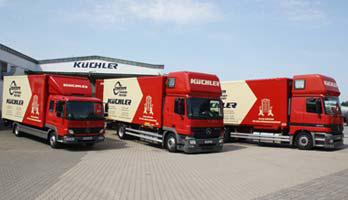 As a partner of the EUROVAN we have access to a Europe-wide network of removal companies which enables us to organize your move all over Europe with the same quality that KUECHLER is known for. At the EUROVAN planning centre in Mannheim, moves are coordinated and planned to ensure best use of trucks, best use of space and therefore reduced costs, and there less environmental damage.